I’m hoping to get another Ookami-san or a SW vector out before the new episodes, but in the mean time, we have Houjou Satoko from Higurashi no Naku Koro ni 08. Seriously, I don’t know why no one has traced this Rena yet. This is Ryuuguu Rena from the Higurashi opening credits, with a few adaptations to account for motion. It’s only fair to warn you, if you want to find out why she has the hooked cleaver (or axe, no one seems certain) don’t do it on a dark, stormy night. 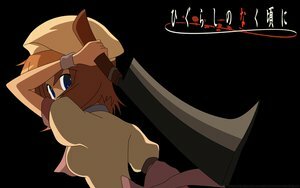 Elfen Lied may have too much blood for some, but for Higurashi it is not about the blood, it’s the pure horror of seemingly normal things going wrong.